Not a "crusader" no crusader heirlooms. With that, I've started searching out more guardian tank sites to link to. You'll see the "Tank Talk" section now on the side bar including a link to "the Inconspicuous Bear". The author contributed a nice write-up on wowhead about beginner guardian tanking. Found this comment with link to a great spreadsheet comparing enchants on various heirloom items. 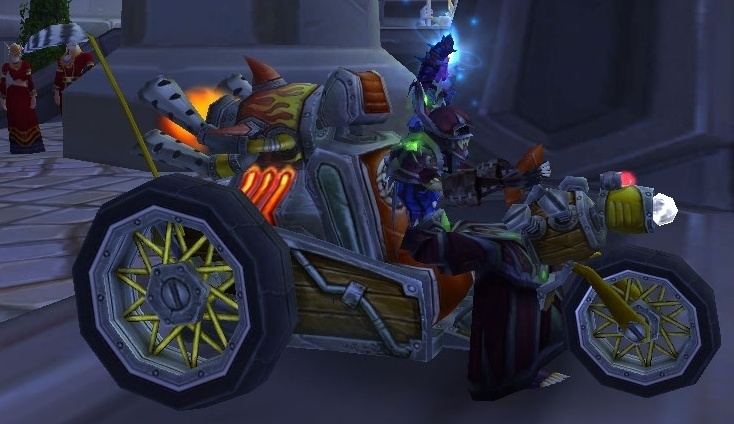 Of course with only 13 levels left to go, I won't be spending the big-bucks on the weapon enchant..
What do you think of Today's base reveals on Azeroth Choppers? Alliance front and back in-line tank treads. Horde trike with dual tank treads on back. I was like, a trike? Um, already got two! (and) Guess I won't be getting a side-car on that..